A herbarium is a collection of carefully preserved, pressed plants stored in special cabinets in a climate-controlled room. Herbarium is also the name for the building or facility in which the collection is stored. Many natural history museums, universities, and natural history surveys have herbaria. What kinds of plants are represented in a herbarium? Herbaria contain a wide range of plants from many different families. In larger herbaria, plants ranging from fungi, lichens, mosses (bryophytes) and ferns, to grasses, forbs, and trees are represented. Plant specimens are dried and mounted on large sheets of herbarium-quality paper and placed in folders, which are organized alphabetically by family, genus, and species. Monocots (the lily family and the grasses, for example) and dicots (most flowers and vegetables) are sometimes the two major divisions or sections within the herbarium. Where do the plants in the herbarium come from? Herbarium collections have a variety of origins. Researchers at academic institutions and museums collect, identify, and preserve plant specimens from natural areas for their herbaria. Botanists and ecologists, both amateur and professional, also make personal collections, which, in time, they may donate to larger herbaria affiliated with museums, universities, and botanical gardens. When private collections are donated, they are frequently catalogued and integrated into the larger collections of these institutions. Many of the earliest and most interesting components of larger herbaria were donated by so-called amateurs, who, in reality, were astute botanists, often with a keen interest in several areas of natural history. For many of these individuals, botany was a second profession. A number of early "second career" botanists were physicians. How are plant specimens preserved? There are two aspects of preservation. The first is the preservation of the physical specimen. After plants have been collected in the field, they must be dried as soon as possible to prevent mold growth. Typically they are placed in a plant press and then moved to a drying cabinet. 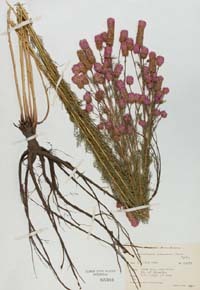 Dried specimens are mounted on special, acid-free herbarium sheets. Good specimens include representative parts, such as flowers, leaves, roots, fruits, and seeds. Fruits and seeds that cannot be pressed flat onto a herbarium sheet are often stored in a paper pouch attached to a corner of the herbarium sheet. Likewise, mosses, lichens, and fungi are sometimes stored in labeled envelopes and are catalogued according to family, genus, and species. The second aspect of preservation is maintenance of the information related to the collection of each specimen. The thorough examination and inspection of the specimen is critical. Herbaria have libraries of reference books, botanical keys, and publications on plant distribution to aid in this inspection and identification. These data provide historical background about collectors, plant populations and distribution at points in time, and sometimes a glimpse at the (Illinois) landscape prior to Euro-American settlement. When looking at collections as a whole, the data provide a picture of the diversity of plants in an area, and inform us of the presence and distribution of rare native plants species and of invasive, introduced plants in a region. This is useful to ecologists, taxonomists, farmers, and conservation scientists. Scientists who study taxonomy, ecology, and evolutionary plant biology use herbaria. People with an interest in the distribution and diversity of plant specimens, for example, historians and landscape archaeologists, also use herbaria. Museum exhibit designers use the herbarium as a research tool when creating exhibit flora or landscape murals for exhibit backgrounds. The herbarium provides plant identification services. The collections of herbaria are educational resources for the community and academia. Sometimes individuals simply want to know the name of an unusual plant that grows on or near their property.